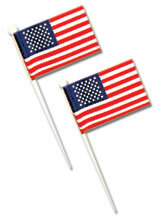 The approximate flag dimensions are 2" long x 1 1/2" tall. Overall height including pick is 4". Pick is made of white plastic.